Tim Cook took the center stage in Steve Jobs Theater on September 12th , 2017 to unveil the company’s latest offerings – the much awaited iPhone X, iPhone 8 and iPhone 8 Plus. It was almost a decade since the first iPhone was launched and here we are, once again, to witness the history in the making. It was a big day for the millions of Apple fans around the world who were eagerly waiting for the new set of iPhones. With much of the fanfare, Apple took the curtains off its latest gadgets along with its flagship offering – the iPhone X.
Apple unveiled the company’s flagship iPhone X along with a host of new products at the new Steve Jobs Theater. The name “iPhone X” itself is synonymous with the tenth anniversary of the iPhone, plus the X sounds much cooler than other letters in the alphabet. The iPhone X is definitely a deal-breaker that Apple CEO said “would set the path forward for the next decade” for the company. The first thing about the phone that catches the eye is the all-screen infinity display which replaces the home button to make the most out of the large screen. The iPhone X sports a whopping 5.8-inch edge-to-edge OLED display along with a few high-end touches. It’s been the company’s goal to design an iPhone that is all display and they actually did it. Apple also replaces the iPhone’s iconic home button which has been in every iPhone made so far. Also comes with the feature-rich package is the company’s latest facial recognition technology called Face ID, which replaces the iPhone’s fingerprint recognition technology called Touch ID. Face ID is a game-changer itself which makes your face the password to unlock the phone. The stunning OLED may be the star of the event but there’s a lot under its sleeves. For one, it becomes the first iPhone to feature wireless charging which is also available in its rival Samsung’s Galaxy S8. The iPhone X packs the company’s latest A11 bionic chip inside, which Apple says is the fastest and the most powerful processor till date. The 12-megapixel dual-lens camera with image stabilization will not go unnoticed which also makes way for augmented reality. The 7-megapixel front-facing camera will revolutionize the way you snap selfies, thanks to the new ‘Portrait Lighting’ feature which helps you create beautiful selfies with artistic backgrounds and studio-quality lighting effects. New color filter and deeper pixels ensure your pictures are more vivid and realistic than ever. Featuring an all new glass design, the iPhone 8 is all glass, front and back and made of aerospace-grade aluminum band which the company touted as the most durable glass ever in a smartphone. The iPhone 8 will be available in three color options – Space Gray, Gold, and Silver. It’s also dust and water resistant so you can worry less about accidental spills. 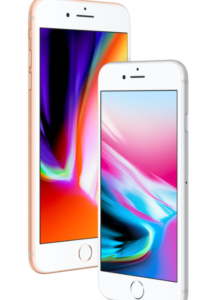 Besides the color-matched glass design, the iPhone 8 shares a lot of common traits with its predecessor iPhone 7 including the 4.7-inch Retina HD display. Apple also launched the slightly bigger variant of the iPhone 8 just like last year – the iPhone 8 Plus. It features the same glass design but with a 5.5-inch Retina HD display similar to the iPhone 7 Plus. The Retina HD display just got little better and more beautiful, thanks to True Tone which efficiently matches the color of the display to the light around you for a life-like viewing experience. Everything looks so vivid and so real with the wide color gamut. The wide view dual-domain pixels allow you to cover every angle for a better view of the whole screen. Coming to camera, it also features an advanced 12-megapixel rear camera with a larger and faster sensor plus optical image stabilization for vivid pictures and videos. The iPhone 8 lacks the advanced Portrait Lighting feature though. It’s capable of shooting 4K videos at up to 60fps and slow-motion 1080p video capture at 240fps, which is double from last year’s offering. The iPhone 8 also packs the new and advanced A11 Bionic chip inside, which is believed to be 70 percent faster than its predecessor A10 Fusion. Thanks to the custom battery design, power efficiency amps up a bit providing up to 2 hours long battery life than the iPhone 7. The newly-designed three-core GPU is also a significant upgrade which is up to 30 percent faster than the A10 Fusion. Both iPhone X and iPhone 8 have significantly different designs. The iPhone 8 is somewhat similar to its predecessor iPhone 7 apart from its all-new glass design with color-matched aluminum finish for the premium touch. The iPhone X, on the other hand, has beautifully rounded corners with elegant curves that definitely puts the phone in the premium range. The iPhone X boasts a whopping 5.8-inch edge-to-edge display which is way bigger than the iPhone 8’s 4.7-inch screen display. The iPhone X’s screen is even bigger than the iPhone 8 Plus, which is 5.5 inches. The iPhone X sports a super-intuitive all-screen OLED display on the front as compared to the Retina HD display of the iPhone 8. The OLED has better contrast and picture quality than the display on the iPhone 8. The OLED display of the iPhone X features a stunning 1,000,000 to 1 contrast ratio that stands up to the premium standards of the iPhone. The iPhone 8 features the new and advanced 12-megapixel rear camera with optical image stabilization and deeper pixels and faster sensor. The iPhone X, on the other hand, has a 12-megapixel dual camera with telephoto portrait lens for studio-quality lighting effects. The front camera on the iPhone X has a new feature in Portrait mode for snapping artistic selfies. The biggest upgrade in the iPhone X is the new facial recognition technology called Face ID, which is a new way to unlock your iPhone. Your face is your password in iPhone X. The iPhone 8 has the usual Touch ID feature. Animoji is the latest addition in the iPhone X which mimics your facial expressions and allows you to take studio-quality portrait pictures using the front camera. The iPhone 8, on the other hand, lacks the ability to create Animoji. Features a massive 5.8-inch edge-to-edge OLED display. Features a 4.7-inch all-glass Retina HD display. No home button. It has the iPhone’s iconic home button. Unlocks the phone using new facial recognition technology called Face ID. Uses home button or Touch ID to unlock the phone. New Portrait Lighting feature for striking lighting effects while taking selfies. Lacks the Portrait Lighting feature. Boasts a dual-lens 12-megapixel camera for outstanding photos and videos. Features a 12-megapixel rear camera with faster sensor and deeper pixels. More expensive than other iPhones. Less expensive than the iPhone X. Screen resolution of 2,436 x 1,125 with 458 ppi pixel density. Screen resolution of 1,334 x 750 with 326 ppi pixel density. For those willing to spend a hefty sum on a new smartphone, the iPhone X is way to go. Well, for an extra grand you get tons of top notch features and a lot more. The iPhone 8 is a cheaper option as compared to the iPhone X but also packs some powerful punches like a faster processor, better camera, and wireless charging. Face ID is a major upgrade on the iPhone X which revolutionizes the way you unlock your phone thanks to the new and advanced facial recognition technology. Both iPhone X and iPhone 8 are powered by the Apple’s most advanced A11 Bionic chip which is faster and more efficient than its predecessor A10 Fusion. Wireless charging is now integrated into both the devices which is a major plus for the new iPhone line-up. Sagar Khillar. "Difference between iPhone X and iPhone 8." DifferenceBetween.net. 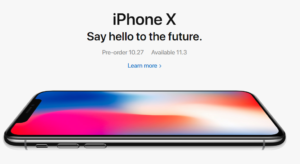 October 24, 2017 < http://www.differencebetween.net/object/gadgets-object/difference-between-iphone-x-and-iphone-8/ >.